Oh the “beautiful people.” Don’t people look different when they act like trash? How much hatred, anger and frustration does one have in order to express themselves in the lowest common denominator possible. 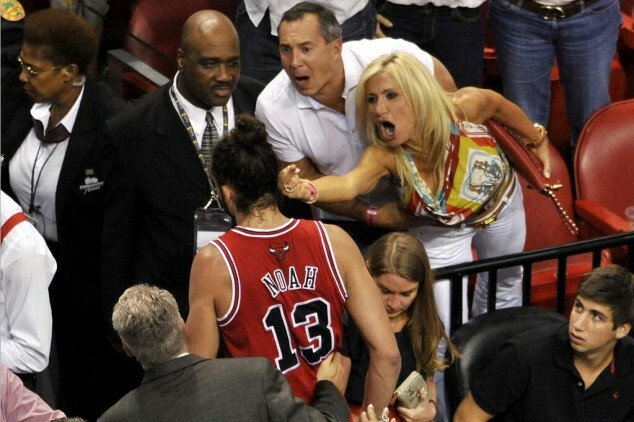 I’m not a Bulls fan or even a fan of Joakim Noah for that matter, but I have to give him credit for not responding to the two low-class Heat fans who felt like expressing themselves at him when he was ejected from game 2 in Miami. I’m curious what happened after this, how did the couple celebrate their “climaxic victory” with a high-five, a cigarette, a beer, what….? Maybe they just wanted a new photo for their Christmas cards this year? This entry was posted in NBA, sports and tagged Chicago Bulls, Joakim Noah, Miami Heat, NBA. Bookmark the permalink. She was hoping Noah was going to slap her hand away so she could drop a lawsuit on him.